Larry Hogan celebrating filing his candidacy. 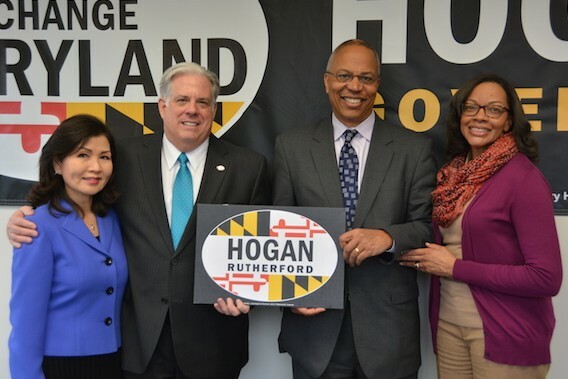 Larry Hogan, Jr., the longshot Republican nominee for Maryland governor, made a smart move accepting public financing for his general election campaign. It frees Hogan from the time-consuming and sometimes humiliating chore of brow-beating friend, supporters and strangers for donations over the next five months. Public financing also lowers the cost of running a campaign. Fund-raising isn’t cheap. Professional fund-raisers keep a sizable chunk of dollars raised for themselves, thereby creating the need for candidates to launch more rounds of solicitations. It’s a vicious cycle Hogan has avoided. He did the same thing in the Republican primary and breezed to election. Hogan seized the high road and can blast the Democratic nominee, Lt. Gov. Anthony Brown, for accepting huge sums from special interests eager to “own a piece” of the next governor — or at least “buy” access when the need arises. That’s an overly cynical view but it’s what Hogan is likely to put forth in his campaign. He’s become the “good government” candidate running without the need to grovel for funds from vested interests that will demand their part of the quid pro quo later. Between the $2.6 million in public financing and the maximum $3.7 million the state Republican Party and its local affiliates can spend on his behalf, Hogan can mount an effective campaign — though Brown still will have a giant edge when it comes to buying advertising time on TV and radio. What could level the imbalance is unlimited spending by independent groups. That’s now allowed under the Supreme Court’s controversial Citizens United decision. If some of Hogan’s well-healed developer friends or national conservative groups backed by billionaires like the Koch brothers and casino mogul Sheldon Adelson decide to advertise in Maryland for lower taxes and an end to big-spending government, Hogan could narrow Brown’s funding advantage. It will not, though, erase the Democrats’ gigantic voter registration lead. That will be hard to overcome regardless of how much Hogan and his compatriots spend. But at least Hogan avoids the fund-raising distraction. He can focus exclusively on issues he wants voters to get “mad as hell” about — the Democratic and cover-up, the continuing spending-to-revenue deficit, continuing hostility toward businesses and favoritism toward Democratic special interests. Hogan badly needed the Democratic primary to end in a bloodbath that shattered party unity. It never happened. Lt. Gov. Anthony Brown and former Democratic primary opponent Del. Heather Mizeur in the Takoma Park Fourth of July parade. Anthony Brown quickly gained strong endorsements from his two opponents. He goes into the general election with the kind of party enthusiasm that will be hard to beat. That’s especially true for a candidate who would be Maryland’s first black governor (technically he not African-American since his father was born in Cuba and his mother in Switzerland). It’s going to be an arduous climb for Hogan, to be sure. He has, though, set a moderate tone that will help him with independent voters and middle-of-the-road Democrats. But Hogan will have to be amazingly lucky and conduct a brilliantly skillful campaign even to make it close in November.